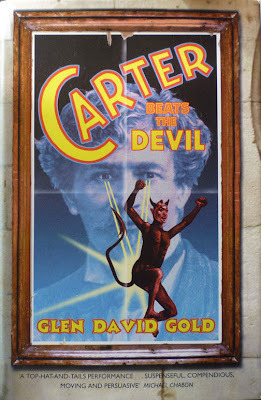 A UK hardback first edition/first printing of Glen David Gold's Carter Beats the Devil, published by Sceptre in 2001. I've heard mixed reports on this one: on the one hand, my friend and former colleague Steve White reckons it's among the best novels he's ever read, while on the other hand my friend and current colleague Roly Allen found it a turgid struggle. So who to believe? 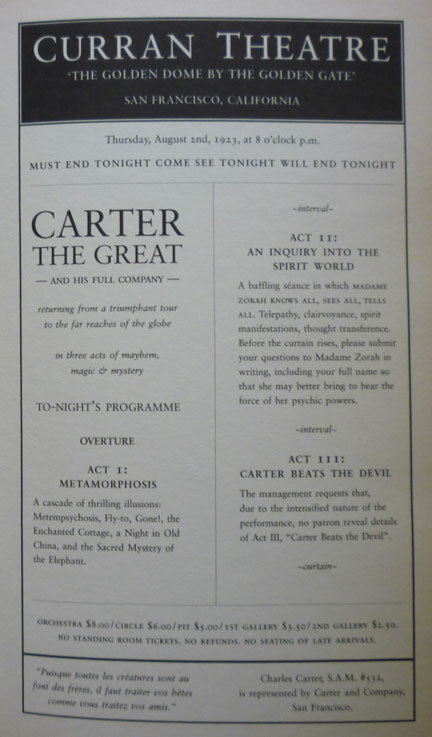 I've always fancied reading it myself – there's something about the story of a magician performing ever more audacious stunts, leading to the death of a president and pursuit by a Secret Service agent which chimes with me – and the reviews at the time were positive. And let's face it, if I want to try a Glen David Gold novel, my choices are limited: he's only written two (the second being 2009's Sunnyside). The cover image on this edition is by Mark Harrison, but I'm confused as to which Mark Harrison. I think it's this one, i.e. 2000 AD/Durham Red comics artist Mark Harrison, but it could be this one, a British painter who quit creating book jacket illustrations in 2003. Even if it's not, however, that Mr. Harrison's website is worth a look for some of the splendid landscape paintings on it, including a few painted round my local area of East Sussex. This one of Cuckmere Haven, not far from Lewes, is particularly fine, and also quite poignant, as the Haven's days are numbered: apparently it's become too expensive to maintain the sea defences, so at some point the plains will be allowed to flood. Anyway, for the next Lewes Book Bargain, howzabout a spot of Stephen King...? I've been wondering about this book since it was published. I've picked it up and put it down several times. 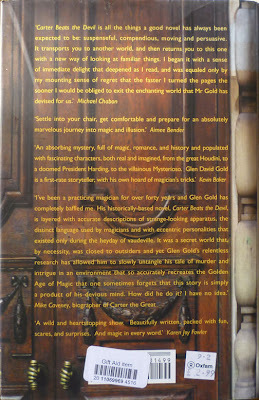 After reading the jacket copy of the UK edition and looking at the cover, I am now inclined to give a try. Though when I will get around to it, who knows?